The Bell 407 is a lightweight seven seat multi-role helicopter with a four blade main rotor and two blade tail rotor, powered by a single turbine engine. Fitted with a Rolls Royce (Allison) model 250-C47B engine with Chandler Evans EC-135 (FADEC) Fuel Control System, the helicopter has a radius of 575 km. 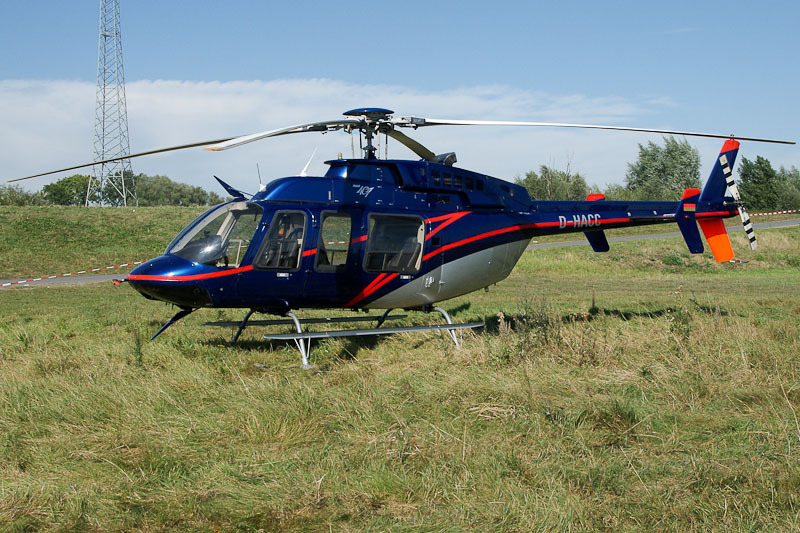 Based on the Bell Model 206 series, the Bell 407 concept is a result of the in 1993 started development work for a replacement for the Bell JetRanger and LongRanger. The first Bell 407 helicopter was a Bell 206L3 LongRanger modified to the Bell 407 concept that flew first as N407LR on 21 April 1994. Prototype / pre-production Bell 407 C-GFOS (c/n 52901) flew first on 29 June 1995, followed by C-FORS (c/n 52902) that flew first on 13 July 1995. First production airframe C-FWQY (c/n 53001) flew 10 November 1995. Full rate production started after receiving the Transport Canada certification on 9 February 1996 and FAA certification on 23 February. First customer delivery was at the Heli-Expo, Dallas, in February 1996. The Model 407GX was introduced in 2011. The Bell 407GX has an integrated glass flight deck that provides aircrews essential flight information at a glance for greater situational awareness, improved operational capability and increased safety. Model 407 c/n 54300 and subsequent are fitted with the Integrated Avionics System Garmin 1000H) and have the commercial designation of 407GX. Bell has delivered over 1100 Bell 407 helicopters to customers throughout the world. The ICAO Aircraft Type Designator for the Bell 407 helicopters is B407. On 20 November 1998, Bell Helicopter Textron Inc., Fort Worth, Texas, registered the 1998 built Bell 407 c/n 53322 as N322RT. On 9 February 1999, registration N322RT ws cancelled as exported to Germany, and the Bell 407 was registered D-HACC with Heli Concept Cologne GmbH, Bonn/Hangelar, the same month. In June 2006, Bell 407 D-HACC was transferred to Heliteam Süd and stationed at Ganderkesee Airfield. On 9 September 2012, the Heliteam' helicopter was photographed at a temporary helispot situated between the river Ems and the Yard harbour of the Meyer Werft in Papenburg, Germany. In February 2014, registration D-HACC was cancelled as exported to the USA. On 21 February 2014, the Bell 407 was registered N407LB with N888LB LLC, Boca raton, Florida, USA.